20 Years and Still Kicking – The 20-Year Celebration of Japan NPO Center. 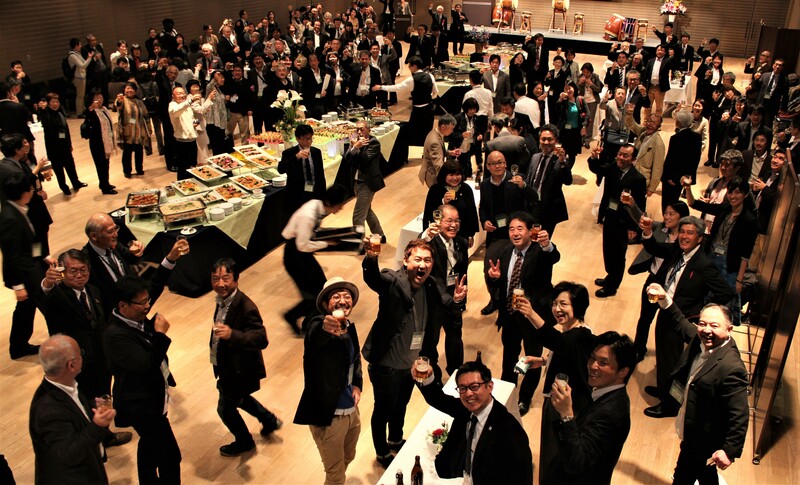 On November 22, Japan NPO Center celebrated its 20th anniversary with an event in which more than 250 people came together to have a kanpai! – a toast to JNPOC’s good work. On stage were Mr. Yoshinori Yamaoka, the guest of honor and founding Managing Director of JNPOC, and Ms. Kyoko Shimada, a long-time corporate philanthropy specialist. They spoke about the 20-year path of evolution and development of Japan’s nonprofit sector. We also welcomed Ms. Kumi Imamura (President of Katariba) and Mr. Keita Yamamoto (COO of Publico), leaders of the younger generation of “social sector” workers who only recently became familiar with the work of their forerunners. 20 years ago, JNPOC was established amid a wave of positive energy that swept through Japanese civil society. The Hanshin-Awaji Great Earthquake of 1995 (commonly known as the Kobe Earthquake) was a massive disaster that killed more than 6,000 people, but a silver lining from the experience was the fact that many people expressed a desire to help in the form of volunteering and donations. This was also a time in which Japanese civil society leaders – many of whom were involved in the creation of a national infrastructure organization for the new nonprofit sector (ie., JNPOC) – were learning from the experiences of the US and other countries as they worked to strengthen the participation of citizens in making a truly democratic society. It was the era of “associational revolution,” a term coined by Lester Salamon to describe the rise of civil society. We thought (I myself was then living in California, but I assisted these Japanese leaders by introducing them to the San Francisco Bay Area nonprofit scene) that we could look forward to a future in which ordinary citizens would be in the driver’s seat when it came to deciding which way society should turn. 20 years later, the term “NPO” has become familiar to Japanese people from all walks of life, and we now have more than 50,000 NPO corporations (Specified Nonprofit Corporations). There is indeed much to celebrate. At the same time, this anniversary has been an occasion for deep reflection. I cannot help but feel that we have a long way to go. The world today is filled with angst, confusion and frustration, and Japan is no exception. We live in a world where the richest 62 individuals have the same financial worth as the bottom 3.6 billion people (according to Oxfam). This massive inequality produces many social ills, and we can never do enough to cure them. As captured in the 2030 Agenda for Sustainable Development, we need to push for transformative changes rather than accepting business as usual. Civil society needs to be at the forefront of this movement. JNPOC and other civil society leaders in Japan need to come out of our own silos and work with those in other sectors who share the same value and common goals for the future, while maintaining and advocating our core values of participation, accountability and inclusion. This is a delicate balance, and we have neither a roadmap nor guideposts. JNPOC has been working on building partnerships across sectors, and we know that it is not a straightforward process. It is crucial for us to use our own internal compass effectively. This compass has been built from the work of the past 20 years and accumulated through our collective insight. If we believe that citizen participation will lead to a good society (and we do), we need to showcase it in different forms so that people can learn from it, use it, and most importantly, join hands. Yes, we have a long way to go and the work is not easy, but like it or not, another 20 years have just begun.